be required to reach the summit. 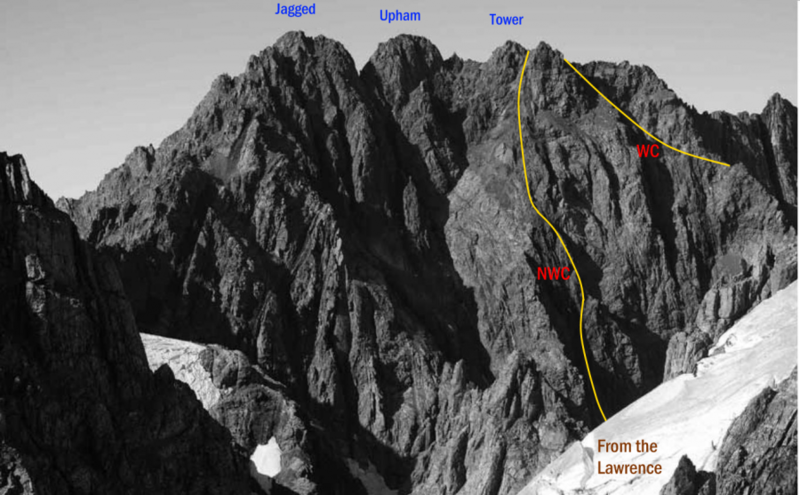 Take the prominent couloir that leads up from the head of the Lawrence Glacier. If out of condition, climb the buttress on the right – on a thin band of solid rock with plenty of small holds. Head out of the couloir onto the exposed rock of a prominent rib, which leads up the face to the summit ridge. Climb a short distance along the ridge to the summit pinnacles. From the basin immediately south of the bend in the Lawrence Glacier, follow the small glacier that leads to the east-trending couloir that runs towards the summit of Tower Peak. Climb the couloir to a notch in a prominent rib. From here, traverse along and slightly down the ridge before heading up diagonally across the face on ribs of sound rock interspersed with friable sections. Gain the summit ridge and climb straightforward rock to the summit pinnacles. Above the second icefall of the Cameron Glacier, gain a snow and ice lead below Pt 2642 metres. Traverse steep, exposed rock to reach the small glacier south of Tower Peak. Follow snow to the crest of the ridge and scramble to the summit, passing most obstacles on the Lawrence side. From Upham Buttress, scramble up an indistinct rock rib right of the hanging glacier south of Tower Peak. The climbing is not difficult but the rock is loose.